Yes, it was this long ago that a group of musicians from the Nickel City (aka Buffalo) gave birth to the GREAT “Skylon Tower” Marathon. Within 2 years we hit 3,000 runners & were amazingly BIGGER than Boston or New York. Yahoo! Our course was proudly used in both these years for the Men’s U.S. Olympic Marathon trials. 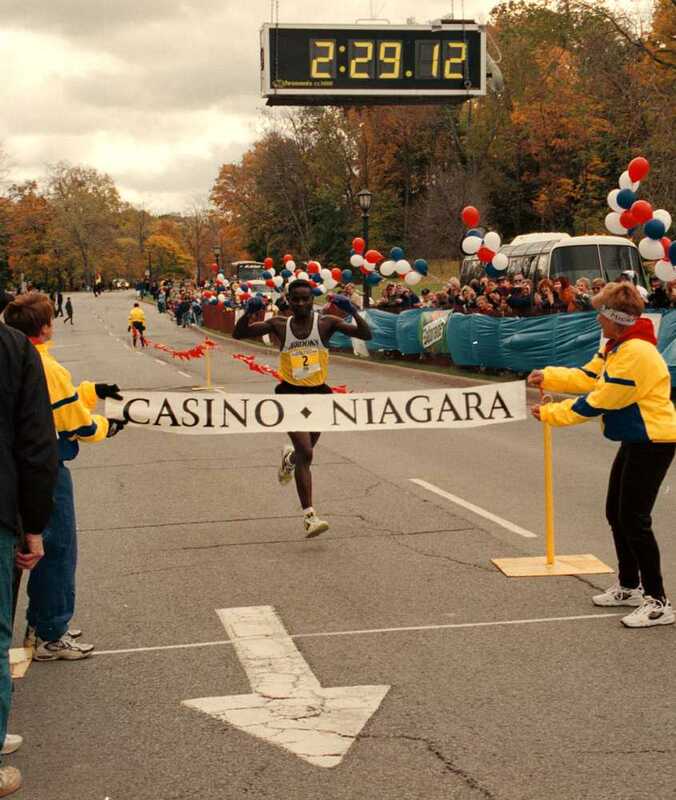 The race died out in 1986 but good news, it was REVIVED in 1998 under sponsorship from Casino Niagara! Check out the groovy photo from the late nineties below! Lots of changes to keep up with the changing running scene! We have 4 race distances with every race finishing at the brink of the Falls & EVERY racer receiving a funky finisher’s medal. Remains a bucket list item with it’s start in Buffalo, New York & crossing of the Peace Bridge into Canada. Flat & scenic. The Peace Bridge crossing is your only big up & big down! Same day race kit pickup is an option with this scenic, flat course. Up for a showdown? This is now “The GREAT Canadian-American 5k Challenge!” It requires NOTHING of the runner except to sign up. We’ll tabulate the average time for every Canadian runner & every American runner post-race. The fastest averaged time will have their country declared as the winner! The prize? A little patriotic shirt branding the following year & bragging rights for the winning team! Did you know we have a new logo? Here’s the thing, we really LOVE what we do! With our Board’s help (yes, we are a registered not-for-profit), we spend a lot of time thinking about what we stand for & where we’re going. 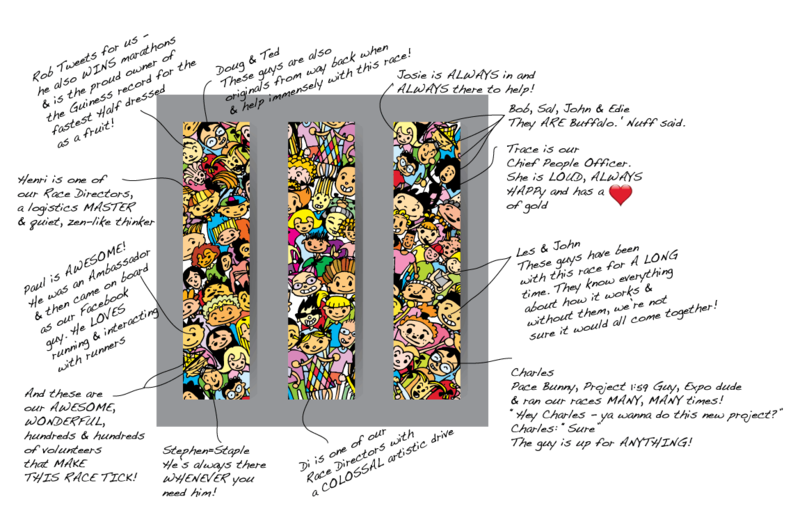 In a nutshell, our Team wants to build an extraordinary Niagara running experience for all our guests. We always want our races to have challenging factors. We want your friends & family to be able to cheer you on & support you as much as possible. We also never, ever, ever want to let go of making this a fun experience! After all, you are coming to one of the world’s most famous tourist destinations! 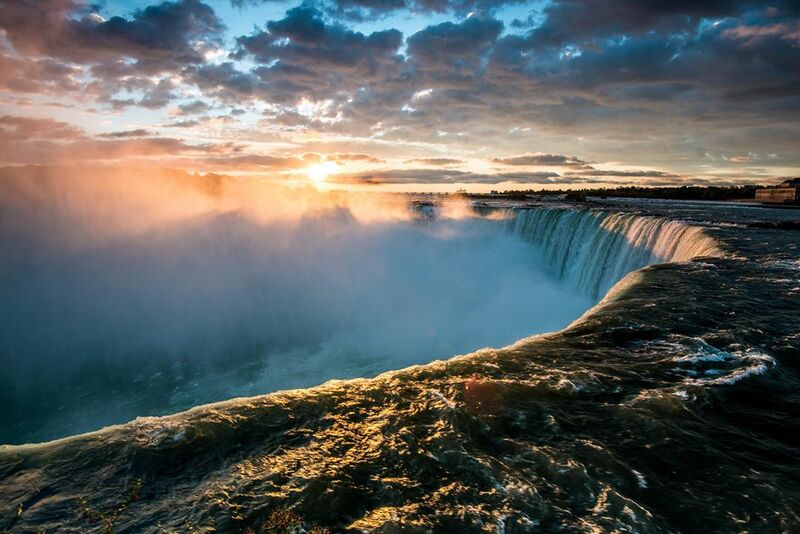 And if you live here in Niagara, we want to build a sense of pride into your hometown event. It may take a few years for us to fully “get there” but we’re working on it!